It's OK to be sad, hurt or even angry for a while after you have been hurt, because to deny yourself those feelings will only stop you moving past the hurt. Accept what happened and let it go. Once you have, happiness will come back to you. Turn your fear into anger, turn your anger into strength, and turn your strength into power. It doesn't matter how hard you fall,it matters that you get back up. Anger is one feeling that has only very bad consequences and if controlled in the right time, can avoid great losses. Lord Emerson says beautifully, “for every minute you are angry, you lose sixty seconds of happiness”. If you do not restrain anger, it causes more hurt to you than with whom you are angry. It is, in a raw sense, a short lived madness. Anger has the tendency to cloud our thoughts and prevent us from thinking rationally. The person who gets angry is the loser and the one at the other end, becomes his conqueror. It is very simple to control anger; just postpone it. Mohandas Gandhi said, anger and intolerance are the enemies of correct understanding. To put it in a nutshell, anger is one word short of danger and therefore, try to control and overcome your anger. 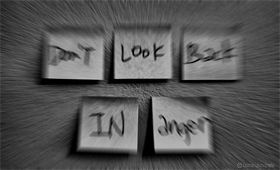 These quotes on anger are suitable to send to your friends and advice them to just give a glance before becoming angry.